It's beautiful outside! Do you know what that means?!? It's GRILL time! The wonderful days of cookouts and grilled foods. I recently found this recipe on Undressed Skeleton - one of my favorite health blogs! I altered it a little to fit our taste. Trader Joe's has pre-cut slices of mango and pineapple. In a blender, blend together the pineapple, mango, peach (with or without skin), teriyaki, and apple pie spice. Stir in the 2 tbsp light brown sugar. Coat the chicken in the fruit marinade. I advise dipping out a little at a time to coat the chicken so that any leftover can be saved or used as extra sauce. The original recipes calls for you to sprinkle Simply Asia Sweet Ginger Garlic Seasoning over the chicken skewers, but we left that off ours. Put about 5 chicken pieces on each skewer. We used metal skewers for the grill and wooden ones for the oven. Remember to soak your wooden skewers in water for about 20 minutes so they don't catch on fire! We put some on the grill for about 15-20 minutes. We also baked a batch in the oven. Grease a 13x9 pan with olive oil spray before placing the chicken skewers. Bake on 350 for 15-20 minutes. Although the baked chicken was great, the grilled chicken was the best! My family really enjoyed these, so this recipe is definitely a keeper. Voila! A delicious and healthy dinner! Shrimp is a great idea! We'll definitely try that. My family loved these, so we'll will be enjoying these some more this summer. Thanks for the great recipe! 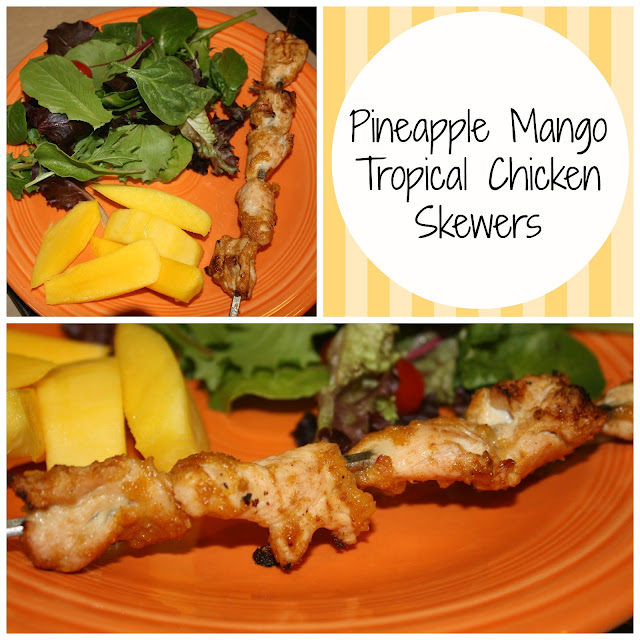 mango and Chicken is such a great combo! Delicious!